San Jose, CA – US Marshal Don O’Keefe is proud to announce the arrest of James Terrell Booker, age 38, in Little Rock, Arkansas. 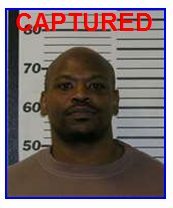 Mr. Booker was apprehended after a nation-wide manhunt involving Federal and Local Law Enforcement from California and Arkansas. Booker was wanted by the U.S. Marshals Service, Pacific Southwest Regional Fugitive Taskforce, after he escaped from a Federal Detention Facility in Southern California, on February 20, 2014. Booker was serving a 104 month sentence for his role in the Distribution of Crack Cocaine within the Monterey County area. It is alleged that, on May 02, 2014, in the City of Monterey, CA, Booker committed an armed home invasion robbery. In desperation to get out of town, Booker fled in the resident’s vehicle. The Monterey Peninsula Regional Violence Team was able to locate Booker immediately after the robbery in a safe-house in Salinas, CA. The Safe-House was surrounded by Officers from the Salinas Police Department, Monterey Co Sheriffs, US Marshals, and ATF. Hours later, Salinas P.D. SWAT entered the Safe-House only to discover Booker had escaped unseen. The US Marshal Service immediately placed Booker on The Northern California’s Most Wanted Website (www.northerncaliforniamostwanted.org). Within days of posting Booker’s photograph, authorities began to receive tips through the website. The anonymous tipsters placed Booker in the state of Arkansas. Within hours of the tips, the US Marshals Service, Eastern Arkansas Fugitive Task Force was on the hunt for Booker. It is alleged that, on January 24, 2015, in Little Rock, AR, Booker forced his way into a home, then pistol whipped and shot a female victim. Booker once again fled unseen. Booker was profiled on Arkansas Most Wanted and within hours more anonymous tips came pouring in.